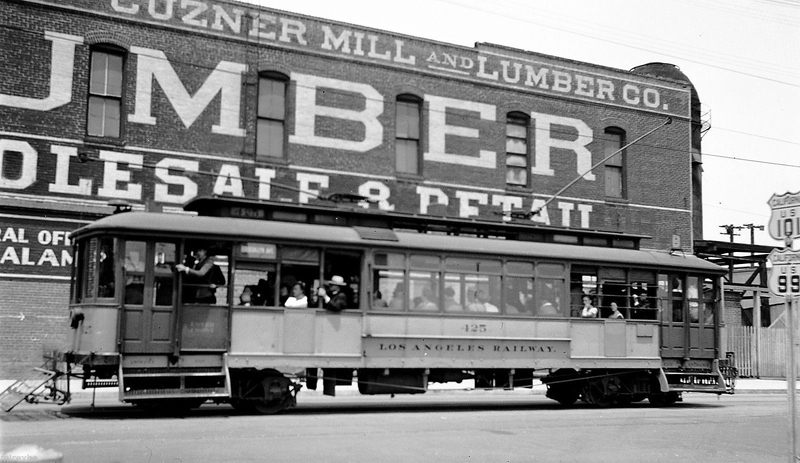 Los Angeles Railway car no. 425 on B Line service pauses for a photograph in front of Kerckhoff-Cuzner Lumber, which we featured earlier in a Ralph Melching photo here. Note the US 101 and 99 highway signs in the foreground of both images. This must have been a popular spot for railfan photographers to capture streetcar action. Car 425 is of interest because it represents an early attempt by LARY to develop a one-man/two man car. According to Jim Walker’s Yellow Cars of LA book, 425 was a type B-11. This type was distinguished from the one man/two man B-10 by the seating arrangement in the center section – the B-11 had the passengers in the center section sitting with their backs to the windows. Whereas the later one-man B type cars had the rear door activated by treadles for disembarking passengers. The B-10 and B-11 cars had all of their doors manually operated by the motorman using a lever arrangement. These cars must have caused some confusion for passengers as they had to decide which end of the car to enter. As you can see from this photo, the painted instructions on the sides of the cars or on the steps indicate that the passengers must enter from the front, but in two man service the passengers were to enter from the usual rear (conductor’s) station. In one man service, the passengers would have had to disembark from the second door at the front of the car where the motorman would control the door.